Satay lovers rejoice! 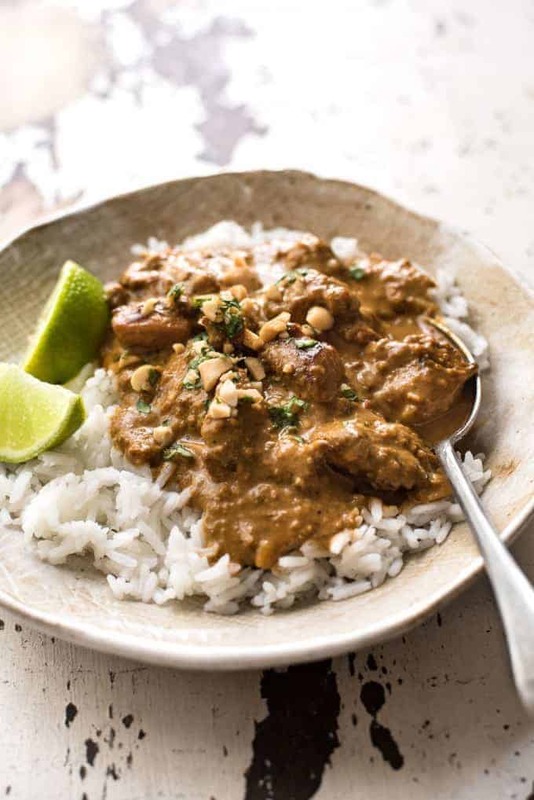 This is the stuff food dreams are made of – chicken marinated in an authentic homemade Satay Seasoning, then simmered in an incredible Satay Peanut Sauce (restaurant recipe!). No hard to find ingredients, no grinding peanuts, this is easy to make and is honestly restaurant quality. I swear! 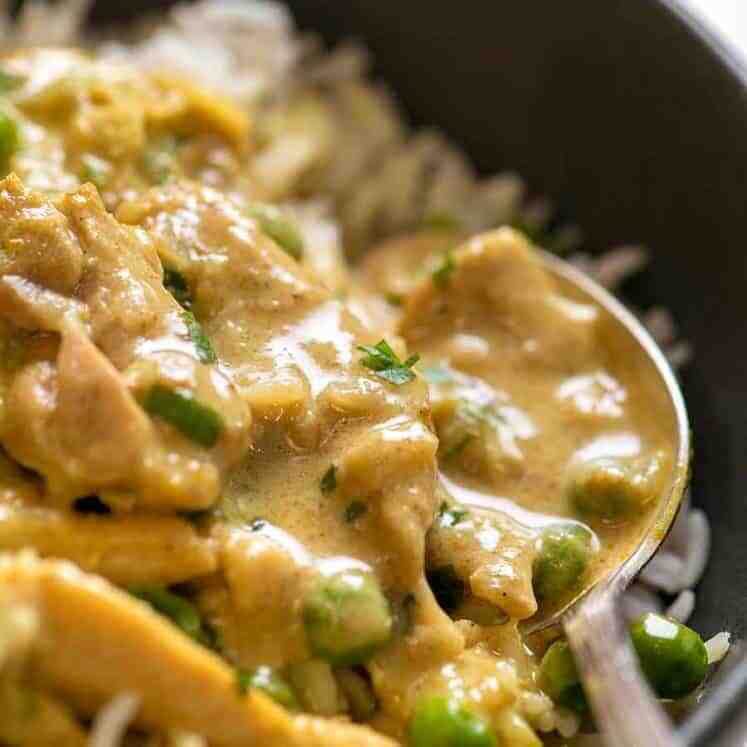 I love a good curry with a creamy sauce, like Everyday Chicken Curry, and quick Thai Red and Green Curriy. 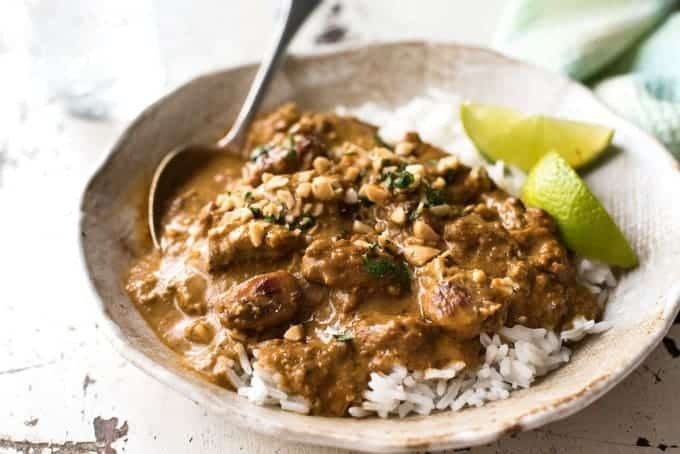 And this Chicken Satay Curry knocks it out of the park! Here by popular demand!! One of the recipes readers have really loved in recent times is my Chicken Noodle Salad with Satay Sauce. I’ve actually lost count of the number of messages I’ve received asking if the sauce could be used to make a curry-like satay chicken!! As far as I know, Chicken Satay in this curry-like form is not authentic Asian. Real Satay Chicken is skewered chicken marinated with satay seasonings, seared over charcoal and served with a peanut sauce. There are various types throughout Asian, the most well known being Malaysian, Thai and Indonesian. All are slightly different, but have similar undertones. I think you will be surprised when you see the ingredients for the Satay Seasoning. All spices that you might already have in your pantry! With the Satay Seasoning, the chicken is absolutely divine by itself. 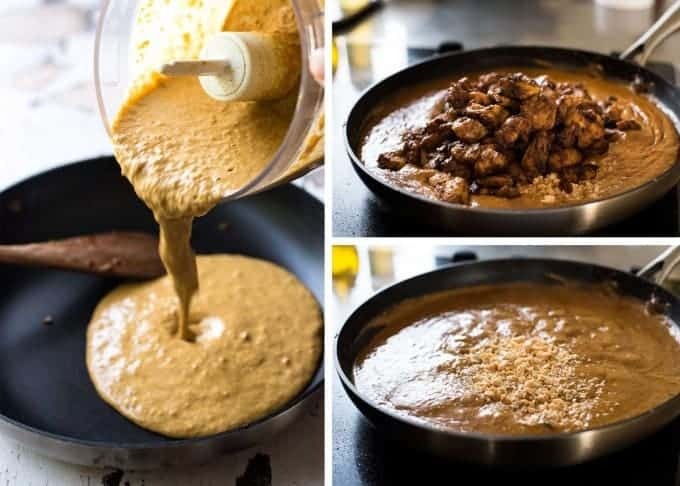 I could honestly eat it straight out of the pan, without the peanut sauce. 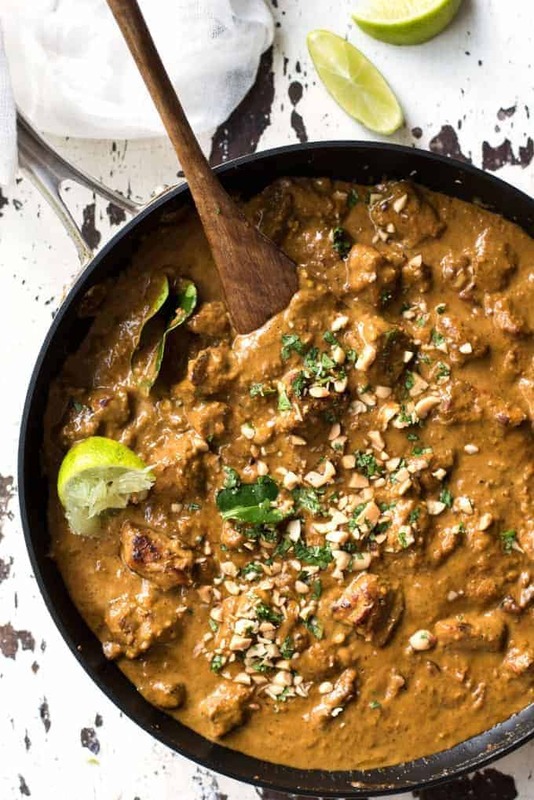 But with the peanut curry sauce….it just takes it to a whole new level. Food euphoria. Food so good it makes you want to cry. And to think this is made from scratch, no jar pastes…just incredible. 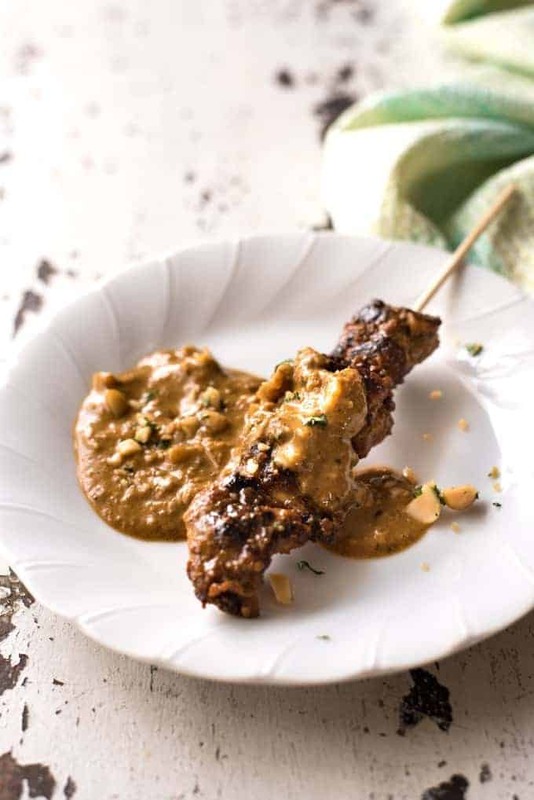 Traditionally Satay peanut sauce is made by grinding peanuts using a mortar and pestle along with spices. Doing that is a pain. And it can sometimes end up a bit gritty, almost like desiccated coconut, if you don’t use fresh peanuts. It’s even more of a pain when you are making loads of peanut sauce for a curry. My taste testers get to try a LOT of food. And I swear to you, this is the most talked about dish in recent times. Their response was incredible, they LOVED it, I kept hearing about it over and over again! Chicken marinated in a homemade satay seasoning, simmered in a peanut satay sauce that is truly restaurant quality. 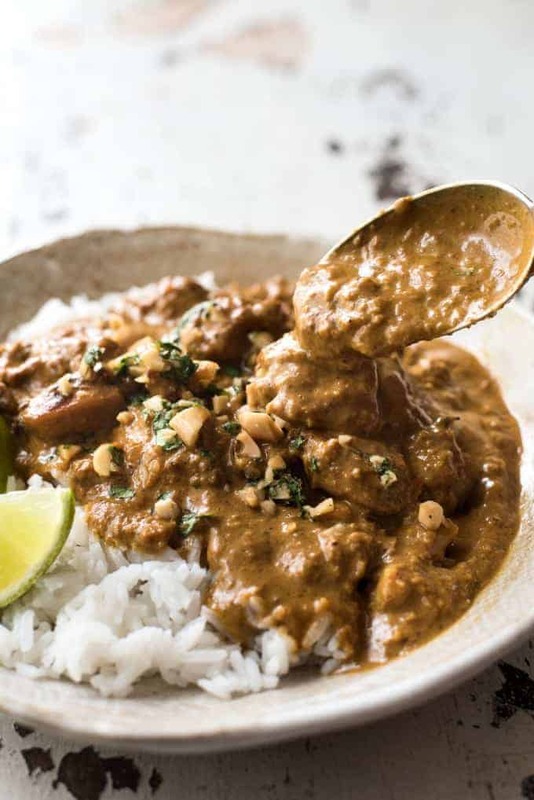 This recipe is adapted from a Satay recipe by a Malaysian chef and the Satay Sauce from Chinta Ria, a popular Sydney Asian restaurant. See notes for more details! MARINATING TIME: 3 hrs - overnight ideal, but even 20 minutes is enough. Combine Satay Seasoning ingredients in a small bowl. Heat 1 tbsp oil in a non stick skillet over high heat (Note 7). Add chicken and cook until browned all over - don’t worry if it’s still raw inside. Transfer chicken to a bowl. Turn heat down to medium high and heat 1 tbsp oil. Add chill, onion and garlic cloves. Saute until onion is translucent - around 2 minutes. Add remaining Satay Seasoning and cook for 1 minute. Add chicken broth and 1/2 cup peanuts, then transfer all the mixture into a food processor or blender. Puree until pretty smooth - some peanut chunks can remain. Pour mixture back into the skillet. Add remaining 1/4 cup peanuts, kecap manis, dark soy sauce, coconut milk, peanut butter and water. Stir to combine. Crush kaffir lime leaf in hand a bit (to break leaf to release the flavour). Add kaffir lime leaf OR lemongrass and chicken to sauce. Bring to simmer, turn heat down to medium low and simmer for 15 minutes until thickened. Add lime juice to taste. Serve with rice, garnished with peanuts and cilantro/coriander leaves. Serve this with fresh slices of cucumber and tomato wedges, no dressing - very Asian, pairs great with rich mains like this. 1. This recipe calls for pure ground Chilli Powder. 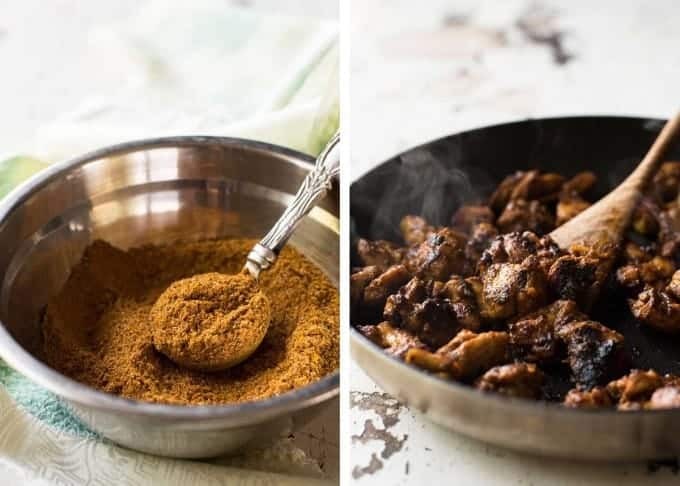 Please note that Chilli Powder in the US is not just pure ground chillis, it has other flavours which will change the flavour of the satay seasoning. You can substitute with cayenne pepper. 2. Use as much chilli as you think you can handle! I use 6 birds eye chillis (small red chillis, about the same heat as Thai red chillis) and it's a bit spicy, but not "blow your head off" spicy. Use 3 for mild heat. Remember there is quite a lot of sauce! 3. Kecap Manis (Ketjap Manis) is a dark sweet soy sauce with the consistency of syrup. It can be purchased in the soy sauce section of most supermarkets (Coles, Woolworths in Australia). Or you can make your own - it's so simple! 4. Dark soy sauce has a more intense day colour than all purpose soy sauce or light soy sauce. I use dark to deepen the colour of the satay sauce. You can substitute with all purpose or light soy sauce. 5. Kaffir lime leaves and/or lemongrass are the secret to peanut sauces that taste truly like what you get at (good) restaurants. When making a dipping sauce, it is usually sauted with the spices. 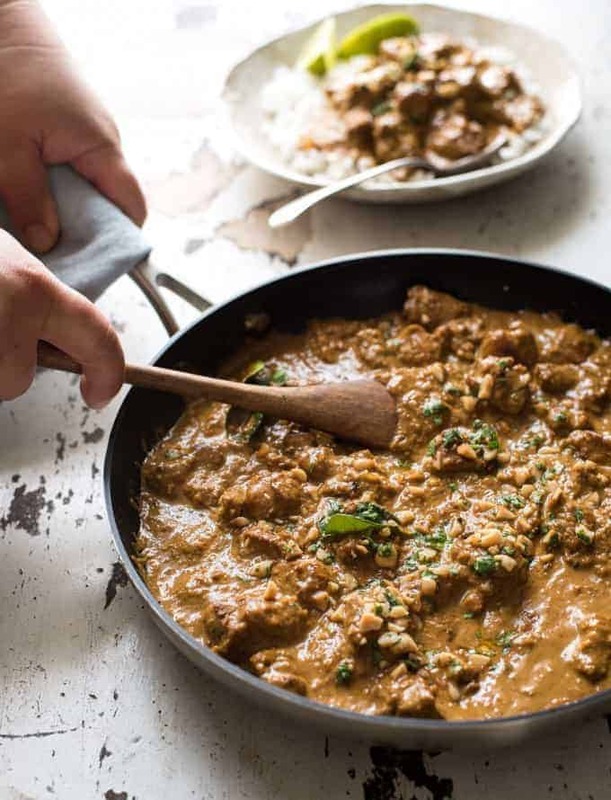 To make a curry sauce, it works great to simmer it with the sauce to infuse the flavour into it. Most recipes use lemongrass, some use kaffir lime leaves. I like using kaffir lime leaves because I always have them in the freezer - fresh leaves freeze brilliantly. I stand firmly in my position that using either is great! - Lemongrass: Cut the top 3/4 reedy green part off and keep the white part at the bottom. Use the side of your knife or anything heavy to smash it to split it open to release flavours. Plonk it in to simmer, then take it out prior to serving. 6. Marinating: 3 hrs - overnight ideal, but even 20 minutes is enough because there is so much flavour packed into the seasoning! 7. Strongly recommend using non stick because of the chunky paste on the chicken. 8. The satay seasoning is adapted from this recipe from Christine's Chinese Recipes which is from a Malaysian chef (!!!) and the Satay Sauce is adapted from this Food Safari recipe by the very popular Chinta Ria restaurant in Sydney. iii) Change the Satay Sauce steps to avoid grinding the peanuts with a mortar and pestle a) for convenience; b) because the sauce for this recipe should be silkier than chunky satay peanut dipping sauces for satay on sticks; and c) because depending on the quality of the peanuts, sometimes it can make the sauce a bit gritty. Also because of the vast volume of the sauce compared to making a dipping sauce, I added a small amount of peanut butter to help create a thick smooth curry sauce as well as adding a touch of sweet rather than using sugar. 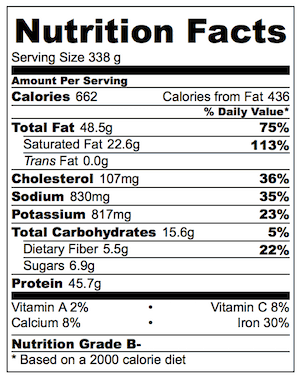 Nutrition per serving assuming 5 servings, excluding rice. Assumes every drop of sauce is consumed – this recipe makes plenty because it’s so nice to eat the sauce with rice! 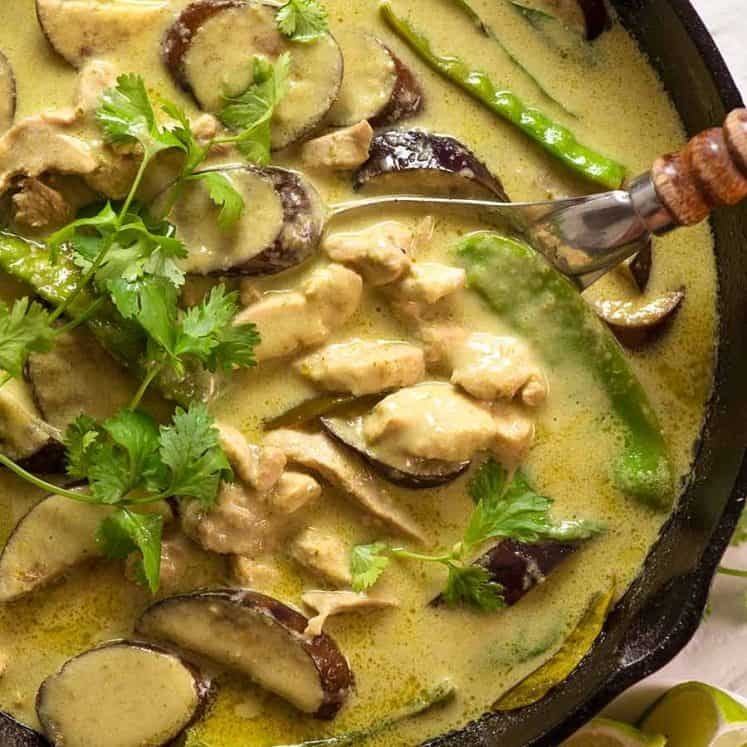 If you use chicken breast and light coconut milk, this reduces to 494 calories. PS This recipe is sensational to use to make traditional Chicken Satay Skewers too. Here – I threaded some chicken onto a skewer so you can see! You won’t need the full quantity of sauce though – around half is enough. PPS The only reason there’s no photo of Dozer drooling over Satay along with you (and me) is because he’s outside gnawing on a bone. 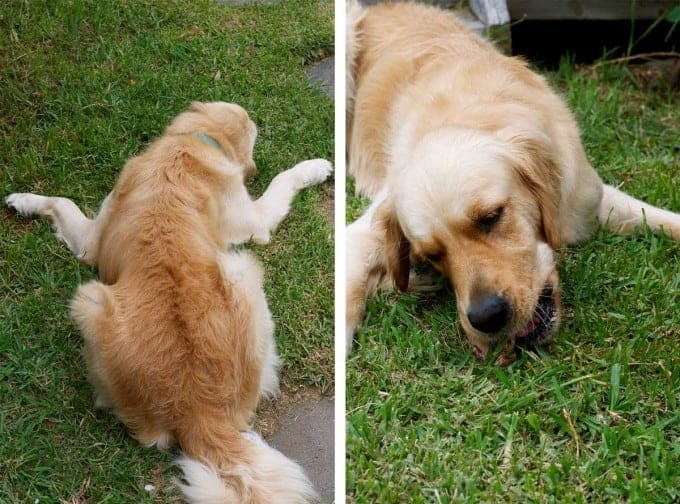 He always splays his front legs out like this when he’s munching on a bone – is this normal?? Looks awkward! Sent a photo. Was a winner. Just wondering why you put the lime juice in right at the end as opposed to step 7 – does the heat do something to it if you put it in beforehand? This is by far the nicest meal that I have ever made myself. I’d say it even exceeds any similar meals I’ve eaten from a restaurant. Thank you so much for the recipe and the clear instructions that even complete novices like me can follow. I added sweet potatoes as an experiment and I was really pleased with the results. This dish has truly inspired a love of cooking in me. I cannot thank you enough! Made too much for my large pot. Had to finish in the oven, tasted the sauce and it is amazing, can’t wait until it’s cooked. The last restaurant satay we had doesn’t even come near the complex flavours and smells that are filling my house at the moment. Wahoo, I hope you love it Sandra! I’m always looking for new ideas for my greedy teenage sons and this beauty hit the bullseye. I even got a “not bad” from my 15 yr old (trust me, that’s a compliment). I’m so glad I came across your blog, I’m going to get stuck in to some of your other recipes big time. “Chicken Noodle Salad with Satay Sauce” – bring it on! PS. I doubled up so we now have another meal ready to go in a few weeks. Also highly recommend Nagi’s suggestion to add cucumber and tomato as a side. Love this recipe ! Can you freeze it ? This looks INCREDIBLE! But I can’t find unsalted nuts anywhere. Would it work if i substitute for salted and just remove the teaspoon of salt from the Satay seasoning? Nagi, I can not put into words what your recipes have done for my household. Honestly, every single recipe has come out absolutely perfectly and everyone who ever tries your dishes that I’ve cooked, raves about them. I wanted to comment in particular on this satay recipe. It is, by far, mine and my fiancé’s all time favourite recipe ever. The complexity of the flavours, the textures, the authenticity, just everything about it is absolute perfection. I have made it SO many times and we are still not sick of it. People don’t believe that I home made it when they try it! Thank you so much for all of your time and effort that you put in to your recipes, blog, and explanations. As I said before, you have made such a big impact on our household and we love and trust everything that you post. This is the best satay I have ever tasted. Perfect recipe, the squeeze of lime is just the best. 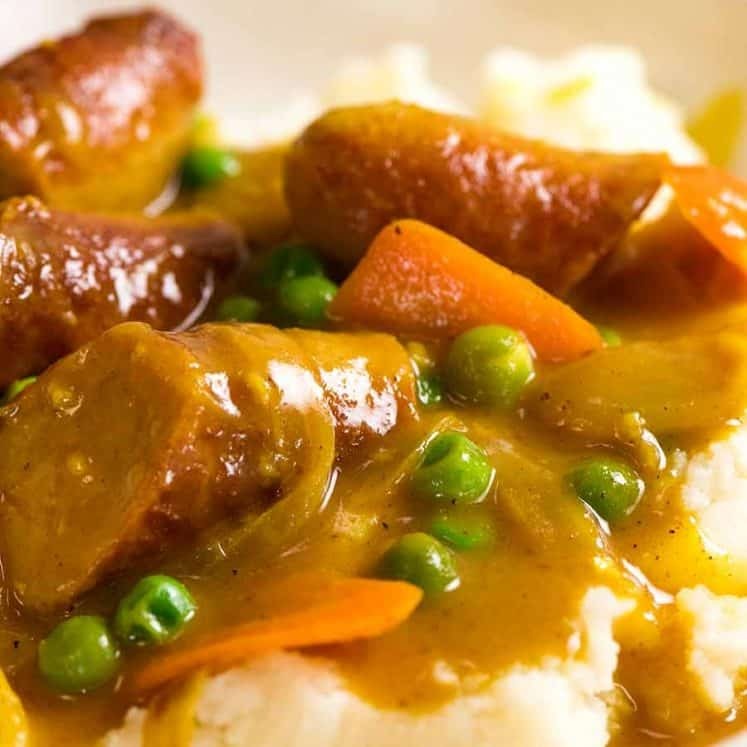 This is so delicious, I’ve made it a couple of times for myself and my husband and I have to say it’s our new favourite Saturday night treat. I do add extra peanut butter but other than that I follow the recipe to the letter. Better than a takeaway, just gorgeous, definitely recommend it, yummy ! just wondering what kind of peanut butter you use? the natural one with only roasted peanuts or the more ‘classic’ peanut butter by the brand kraft or bega (with added oil, salt and sugar)? 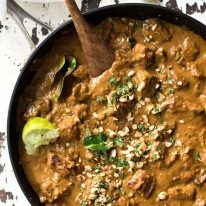 This is honestly the best satay curry my family and I have ever tasted!!! And so easy to make too!!! I’ve made it twice in the last 3 weeks and my husband keeps asking me when I’m going to make it again – and the kids love it too! I don’t normally comment on recipe posts, but I am blown away by your site, which I stumbled on a couple of months ago. I have since tried a number of your other recipes and each one has been an astounding success in my home. A South African living in the UK, I’m a lover of world cuisines (food in general, in fact) with South East Asian being my top favourite. Your recipes are simple, TASTY (the most important) and easy enough to rustle up during the week – I also love the fact that you cook from scratch – I too, avoid packets and jars wherever possible. And then to top it off, not only is your food excellent, but you also have excellent taste in dogs!!!! I grew up with a goldie (‘Dexter’) and I love everything about them 🙂 Dozer looks just like him…. I couldn’t beleive all of the “amazing” feedback on this recipe so off course I had to test it for myself! Another amazing dish. I used to have another blogger as my ‘go-to’ but you have now taken on that role! And thank you so much for putting up the nutritional info – our 11 year old has just been diagnosed with Type 1 Diabetes and we need to count the carbs in each meal and you make it super easy for me! I made it and thought it was delicious ! What side dishes would you suggest ? And a dessert that compliments this main course? Amazing!! Made this for the first time tonight and will definitely make it again (and again and again…). I put some lemon zest in instead of the lamongrass, came out great!